The McCloud Hotel is a wonderfully restored historic Mt. Shasta Inn located on the southern slope of Northern California’s most famous mountain. Enjoy all seasons at our Hotel. Your stay with us includes a hot made-to-order Breakfast. Enjoy the convenience and privacy of a hotel while indulging in historic hospitality offered by the owners and on-site innkeepers. 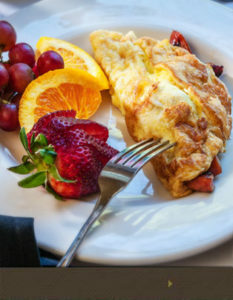 Delicious full breakfasts are included with your stay at our Mt Shasta inn. Dine at one of our individual tables set for you. Enjoy hot coffee or tea at the antique buffet or take your morning beverage to your room or out on the front porch. Choose from four spacious suites, six garden view rooms or six west facing rooms. Two of the suites have whirlpool tubs for two, separate showers, and a lovely sitting area along with many more fine amenities. The Copper suite has a two-person copper soaking tub. The family suite has 2 queen beds and a spa bath with jetted-tub. The rooms provide comfortable Queen or King beds, private baths, and some accommodate extra guests with twin and trundle beds. Enjoy our Mt. Shasta inn’s spacious Lobby and Fireplace. From its original registration desk with mail-cubbies to the warm patina of aged pine, the lobby will beckon you to relax and reminisce. Cozy up in an overstuffed chair or sofa. Enjoy a variety of music and recall a quieter, unhurried time. This is the perfect place to enjoy a complimentary glass of wine between 4:00 and 5:00 PM.